Below you will find some articles about the resistance in Iraq and why they need and deserve the support of the antiwar movement. The Iraqi Resistance is a national liberation movement struggling against occupation for justice, peace, and self-determination. And while “TROOPS OUT NOW” must remain the central and unifying slogan of the antiwar movement, raising political support for the Iraqi Resistance is one of the main tasks of anti-imperialists in the movement today. Chianciano, Italy – An historic conference with leaders of the Iraqi national resistance was held here last week. It was the first time that representatives of the Iraqi resistance have been able to speak in the West. Organizers had previously attempted to hold the conference in the fall of 2005, only to have the Italian government withhold visas from the Iraqi participants after intense pressure from the United States government. The scope of the conference extended beyond Iraq to include the resistance movements in Palestine and Lebanon, as well as representatives from the antiwar and liberation movements in countries from around the world. The Iraqi Revolutionary Maoist Organization (IRMO) is a revolutionary internationalist Marxist-Leninist-Maoist organization aiming at organizing the theoretical and armed struggles in order to carry out the socialist revolution and to establish the dictatorship of proletariat, also to execute the tasks of building the humane socialist society and a civilized world. Our aim is to put an end to the exploitation and slavery of man by man, to break the chains and shackles of the makers of peace and bread, that is the working class. The sole path of salvation and liberation from this class-slavery of the bourgeoisie, local and international capitalism is the intellectual struggle to educate our working class and peasantry about this iniquity and open-slavery of mankind by imperialist capitalism, as well as educating them about the iniquity of the Anglo-American occupation and the Iraqi puppets who came along with them, whether they be sectarian bigots, nationalists, tribal leaders, Baathists, political-Islamists, or –more dangerously- opportunist revisionist left which acts as an agent to the bourgeoisie and to the Americans. This same left which worked previously with the Fascist Baathist regime of Saddam, is currently working with occupation. Besides working on the spreading of class political consciousness, our movement has its military wing, hence the armed struggle by means of people’s war of workers, peasants, unemployed and their allies from students, women, trade unions, workers councils and organizations and revolutionary intellectuals. Our movement has been, and currently is, present on the land of Mesopotamia, it carried out proud and heroic struggle against the invaders and their puppets and mercenaries of police, army and their security apparatus which is a puppet of Mussad, America, Iran and criminal sectarian militias. We have sacrificed our most honoured and most glorified comrades whom had honourably and proudly fallen as martyrs of Iraqi patriotic spirit, of the Iraqi revolutionary communist movement and of our Iraqi working class and Iraqi peasantry and their principles and aspirations for justice and welfare, for national, economic, social and cultural independence, and for the liberation of Iraqi women from injustice and inequality in society. Our Revolutionary Maoist Organization has given some of its best cadres, immortal heroes among which comes our leading, revolutionary communist intellectual, our immortal martyred comrade ELWAN. Despite his high academic achievements, he sat an example of a proletarian human being, thus the evil forces have murdered him using its usual dreadful methods. His life ceased to pulsate, but the revolution never ceased beating with his immortal history which he left as a revolutionary heritage to the comrades following his path. Another martyr of our comrades, proletarian comrade ABO ESHTAR, a cadre who adhered to the spark of proletarian armed revolution and a member of the founding board of IRMO and a member of its political cadre. Our immortal heroic martyred comrade JANGOZ (IBRAHIM ALI), a vanguard cadre, a proletarian intellectual who stood courageously against the hated sectarianism and Nazi nationalist and ethnic conflicts. As an opponent to the imperialist invasion of Iraq and other areas in the world, he upheld the torch of class struggle to the workers until he was expelled from his job as a university lecturer, consequently he was forced to work with manual workers. Our comrade was a prominent member in Maoist RED STARS FRONT, a comrade whose loss could never be compensated for, particularly under these exceptional circumstances. Our organization has lost many of its vanguard revolutionary cadres who were prominent on the level of leadership as well as the level of intellectual activity, it has also lost many of its guerrillas, in addition to those mentioned is comrade FAHAD, a member of the board for additional tasks. The rotten, criminal, fascist, racist gangs of Jaafari and Maliki, supported by the military of imperialist Anglo-American forces, experts and gangs of Mussad, have assassinated our leading comrade. Our revolutionary heroic comrades of Iraqi revolutionary Maoist RED STARS FRONT (RSF) have carried out several military operations against the occupations forces and the apparatus of the puppet regime (army, police and security services). Among those operations are OPERATION SPARTAKUS (Slaves’ Liberation Rebellion) on 26th of October 2005, and two other revolutionary operations BREAD and PEACE on Tuesday 2nd of March 2006. On the 18th of March 2006 in Samaraa, our comrade NEWROZ (REZGAR MOHAMMAD), a university student, was arrested in a crossroad while he was accompanied by his wife. Our comrade has been subjected to the most barbaric and ferocious methods of torture on the hands of mercenaries of the fascist front composed of sectarian National Guards, swine of “Pesh Pesh Marga”, wolves of BADER, remnants of Baath and the Iranian intelligence services. Glory to our hero and martyred comrade Rezgar Mohammad! On the 19th of the same month, comrade AHWAR, an unemployed manual worker, was arrested and subjected to the same savage torture. Like comrade Rezgar, he stood up heroically against the coward and dirty torturers. On the same day in which comrade Rezgar was martyred, the 20th of March 2006, comrade AHWAR got martyred. IRMO is present among the ranks of our Iraqi people, the proletariat, the peasantry, the students, women, trade unions and workers’ organizations, and the intellectuals. We are active underground due to the political situation imposed on us by occupation, and due to the anti-people policies of their fascist-Nazi agents. We clearly declare that we work completely in secret with a security apparatus in order to ensure the continuity of our political activities to uphold the revolutionary communist principles, as well as to ensure the protection and strengthening of our armed wing, allowing our comrades to expand the front, the RSF, a front of immortal heroism known nationally, regionally and internationally. Despite the fact that our organization was, and still is, underground, independent and has no organizational ties with the Iraqi Marxist-Leninist Revolutionaries’ Regroupment (IMLRR), the latter has taken the initiative and suggested a coordination between us on the level information and media. Unfortunately, the IMLRR has exploited that coordination on the expense of the struggle of our conscious comrades, those who have participated in the establishment of our people’s war movement of the Iraqi proletariat, the RSF. We should not waste this chance to salute our comrade, HAMORABI, for his heroic revolutionary vanguard role in embracing the armed strategy of Marxism-Leninism-Maoism, a strategy followed by our immortal martyrs in this long march; his thorough understanding of Marxism-Leninism-Maoism and the exceptional circumstances of Iraq at the current stage, a stage of American occupation which needs a study and analysis of the class struggle and the classes that have an interest in getting rid of class exploitation and imperialist occupation, and those which do not. According to such analysis, the strategic slogan that represents the aim of the Iraqi Maoist movement would be deduced. Lenin has correctly said: “during the course of history, any class that wanted to dominate had to have political leaders within its ranks, vanguard representatives capable of organizing the movement and leading it”. He adds: “effective and experienced party leaders are forged slowly and with difficulties. Without this, the dictatorship of the proletariat and its unity of will are nothing but empty of all meaning”. Thus, Marxist-Leninists see the revolutionary party as a real staff of the proletariat, such a party has to correctly solve the relationship between leaders and party, classes, masses, and organization according to the principle of central democracy. Such a party must have a relatively stable leading nucleus composed of experienced leaders able to maintain a unity between the universal truth of Marxism-Leninism-Maoism and everyday practice of the revolution. Such leaders emerge from class struggle and the revolutionary movement of the people, and whether they are members of central committee or local party committee, they are absolutely loyal to their blood and flesh, the masses. Such leaders have the ability to concretely express the masses, and coherently put their ideas into action. Those leaders are true representatives of the masses. The Communist Party of China has always emphasized the Marxist-Leninist theory on the role of masses and individuals in history, the relationship between leaders and party, classes and masses, and linking those relationships with the principle of central democracy within the party. Our martyred comrades have planned the work among masses as well as the political, practical and theoretical programme by adopting the strategy of armed struggle to defeat the capitalist enemy, domestic and foreign, a strategy built on psycho-technology: the use of media to psychologically weaken the class enemy. However, the IMLRR wanted to impose its will on our decisions and our essays published by MODERN DISCUSSION as well as their website. Most of those essays have been written by the Political Cadre of IRMO, despite the changes, omissions and mistakes carried out without consulting us. In addition, we have sent them many essays which they refused to publish without giving any reasons. Despite this practice, we decided not to expose such actions, taking into consideration the difficult political and practical situation of our comrades in IRMO and the armed wing RSF, as well as the situation of our heroic Iraqi people, a situation shaped by oppression and enslavement particularly of our working class and peasantry. For all of that, we decided that it is inappropriate to expose this discourtesy and this non-comradely behaviour which do not benefit the revolutionary communist struggle or the local or international working class and peasantry. We do not seek here to openly attack the comrades of IMLRR, it is not one of our aims here, however, we would like to emphasize the fact that we have been, and are on ground, present on all fields of struggle: theoretical, social, economic and military; we are present on the soil of Mesopotamia and not on the pages of internet, there is a difference. We understand reality as it is on ground not as it is on satellite TV channels and websites, we are not living in Europe and dreaming of socialist revolution and dictatorship of proletariat without any comrades or partisans present in the motherland. Surely this would be a dream which is not built on dialectical analysis, that is revolutionary Marxist-Leninist analysis. Meanwhile, our comrades who established the RSF- which is carrying out the armed Maoist proletarian people’s war- are currently working, with rifles on shoulders, to expand and develop the revolutionary struggle, hence to develop the proletarian revolution and the subjective ability to carry it out, as well as to raise our organizational methods in all fields to a higher level. We are ought to be an organized nucleus and a spark to the first Maoist proletarian people’s revolution in the Middle East and a vanguard of middle eastern movements with all the high consequent responsibilities and all what it takes in terms of struggle and fighting. We realize that our spark has shined on the Middle East and the world and that it will be an example of firm adherence to revolutionary Marxism-Leninism-Maoism as vanguards of the east! Our Political Cadre and the leadership of RSF have proven to be reliable since they have paved the path, in its most difficult stage, to the first Iraqi Maoist armed proletarian people’s revolution! We know that our voice and our struggle has attracted the attention of the Nazi Anglo-American governments of Jaafari and Maliki, which explains the fascist dirty conspiracies they plotted with the purpose of annihilating our cadres and destroying our movement. However, our movement is growing and getting stronger, and its revolutionary schools are competing, those schools which are smashing the fascists’ conspiracies today, will tomorrow smash their bloodthirsty barbaric rule. Therefore, we will continue our struggle and will adhere to our principles, we promise our martyrs to take the cause forward and to put their revolutionary testaments into action as a guarantee for bearing the difficult circumstances and to avenge for their martyrdom. We wholeheartedly salute comrade HAMORABI for his revolutionary proletarian heroic leading role in founding our organization and its armed wing RFS. LONG LIVE IRAQI AND INTERNATIONAL MAOIST MOVEMENT! LONG LIVE IRAQI WORKERS AND PEASANTS! LONG LIVE ARMED MAOIST INTERNATIONAL REVOLUTIONARY PROLETARIAN PEOPLE’S MOVEMENT! HONOUR AND GLORY TO THE IMMORTAL MARTYRS OF IRAQI REVOLUTIONARY MAOIST ORGANIZATION! SALUTES TO ARMED PEOPLE’S MOVEMENTS IN NEPAL, PHILLIPINS, INDIA, COLOMBIA, IRAN, TURKEY AND PERU! SALUTES TO MAOIST COMMUNISTS IN MOROCCO, SYRIA, LEBANON AND THE ARAB GULF! LONG LIVE IRAQI MAOIST PROLETARIAN PEOPLE’S WAR! LONG LIVE LEBANESE NATIONAL RESISTANCE AGAINST ZIONIST ISRAELI AND AMERICAN INVADERS! LONG LIVE PALESTINIAN PEOPLE’S RESISTANCE AGAINST THE BARBARIC CRIMINAL ISRAELI ATTACKS ! By far the biggest story and best-kept secret in the Western media has been the steady development of the Resistance to the U.S.-led occupation of Iraq. While the attention of the U.S. information services and its accomplices has been fixated on the sectarian violence among various ethnic and religious communities, the Arab Ba’ath Socialist Party has steadily been uniting and cooperating with all in Iraq who show themselves to be committed to ridding their country of occupation and restoring it to the exercise of self-determination and a resumption of its role at the forefront of the Arab struggle against Imperialism and Zionism. The occupation of Baghdad by U.S. forces and Bush’s declaration of “victory” in 2003 marked the beginning of the Ba’ath led Iraqi Resistance. Saddam Hussein and other Ba’ath leaders, in consultation with people in Baghdad, dispersed throughout Iraq and began to fight a protracted War of national liberation in resistance to the occupiers. They refused to remain concentrated in Baghdad so as to save that city from destruction and to enhance the successful transition to a guerrilla/ People’s War mode of struggle. While the U.S. was sponsoring exiles to turn death squads loose on the Iraqi people, targeting those who supported the Ba’ath or were otherwise opposed to the occupation, the Ba’ath and its allies and partners operated on the basis of militarily engaging the enemy, including his puppets and stooges, scrupulously avoiding the harming of innocents and promoting unity among all Iraqis from all religious, ethnic and political backgrounds who are interested in liberating and defending their nation. In spite of repeated attempts to co-opt, discredit and divide it the Ba’ath, it is remarkable that no leading Ba’athist has been induced to betray his Party’s principles of promoting Arab unity, striving for freedom from the USA and Jewish-state occupiers of the Arab lands, and building a socialist society which serves the welfare of the popular classes. Saddam Hussein has emerged as the great steadfast leader and Martyr and modern Founding Father of Iraq, a stalwart in the Arab cause and a champion of Islam in the tradition of Salah-al-Deen Al-Ayyubi , the fabled “Saladin” who drove the Crusaders out of Jerusalem and stifled their efforts at occupying Palestine and subjugating the forces of Islam. Saddam’s activities and his example have contributed immeasurably to the re-emergence of the Ba’ath at the heart and head of the Resistance in Iraq, although this remains a closely-guarded secret in America and the West. Even Leftist and allegedly “progressive” circles who have nominally supported past national liberation movements such as in Vietnam have not been forthcoming with similar expressions of solidarity for the Iraqi counterpart. Instead, they claim that the Ba’ath “died with Saddam”, that the Resistance has been crushed and only the media-touted “civil war” remains to be seen in their field of vision. The Resistance simply does not exist for them. Fortunately, it not only exists but is waxing fiercely throughout the country at the present time. A signal event occurred in September when 22 Iraqi Resistance groups convened a Unification Congress in a liberated area of Baghdad. The Congress resolved to unite all the groups who were in attendance on the basis of achieving the total liberation of Iraq, however long that may take. The Congress also decided that membership in the unified Resistance Front would be open to other groups or fighters wishing to join. A Supreme Command of the Jihad and Liberation Struggle was created and Izzat Ibrahim al-Douri, Ba’ath Secretary-general and President of Iraq, was elected the Supreme Commander of the Front. The Supreme Command then convened its own meeting at which a General Staff was created. Lieutenant General Amir Muhammad Amin was named Deputy Supreme Commander for military affairs, while Shaykh ‘Ali Abdallah al-Ubaydi’ was chosen to head a religious consultative body. A national security board was formed to be headed by General Khalid Sulayman Khalaf. A board for administrative and financial affairs was created under the command of Lieutenant General Muhammad Salih Alwan and an information and mobilization bureau set up under the command of General Salah ad-Deen Ahmad. Dr. Kan’an Amin was selected as official spokesman for the Jihad and Liberation Command. Officially recognize the patriotic Resistance, with all the patriotic, Arab nationalist and Islamist Resistance organizations, as the sole legitimate representative of Iraq and its great people. Officially announce an unconditional withdrawal from Iraq, whether immediate or in quick stages. Halt raids, pursuits, killings, destruction, sabotage, dispossessions and expulsions and withdraw the occupation troops from all population centers. Free all prisoners and detainees without exception and compensate them for their losses. Return to service the Iraqi Army and national security forces, to be restored in keeping with the rules and traditions that were in force before the American invasion. They must also be compensated for their losses. Pledge to compensate Iraq for losses and injuries to the country caused by the occupation. Cancel all laws, decrees and other pieces of legislation issued during the occupation. If the enemy wants to withdraw in a face-saving manner, they should sit down and speak directly with the Resistance to discuss the implementation of these sacred principles. Otherwise, their only alternative is collapse and flight. 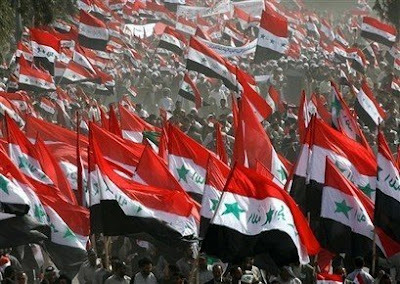 After preparing a program for the implementation of these principles, meetings and dialogs will take place between the people of Iraq through the interim government with the aggression states to reformulate official relations with them on the basis of equality and non-interference in the internal affairs of others, respect for independence, sovereignty and self-determination. After the start of the withdrawal of the enemy from the homeland, the Resistance forces will meet for the formation of a national council (shura) to oversee the transitional phase and appoint a transitional government for an agreed-upon period of time, to prepare for Legislative Assembly elections so that the people can freely elect its own leadership. 1 – Army of the Naqshabandi Order. 6 – Unified Command of Mujahedeen (Iraq). 9 – Jaysh Tahrir Iraq. 12 – Kataeb al-Jihad al-Ard al-Rafyein. 13 – Jaysh al-Faris (in the Kurdish “self-rule” area). 14 – Saraya al-Jihad (Basra). 15 – Saraya al-Falluja al-Jihadiya. 17 – The National Popular Liberation Front off Iraq. 18 – Saraya Altaf al-Husseiniya. 19 – Saraya Tahrir al-Junoob. 21 – Saraya Diyala for Jihad and Liberation. 22 – Saraya Al-Majd for the Liberation of Iraq.